In general, my laboratory looks at understanding how immune responses shape and are shaped by malignancies. Where possible, our hope is to exploit these weaknesses to improve patient outcomes by enhancing response to conventional, targeted or immunotherapeutics. At current the laboratory focuses primarily on pancreas and breast cancers. 1) Understanding the impact of fibrosis on tumor immunity and responses to immunotherapy. Example Project: The prognosis for pancreatic cancer (PDAC) patients is dismal. The application of immunotherapy holds the promise to revolutionize PDAC patient outcomes. Unfortunately, attempts at immunotherapy in PaC, to date, have not achieved significant clinical benefits as single agents. This is likely due to the presence of a uniquely suppressive tumor microenvironment (TME) that is dominant in most pancreatic ductal PDAC. Two major drivers of this tumor protective microenvironment include a dense fibrotic tumor stroma and robust infiltration by tumor-supportive myeloid cells. High stromal density provides a barrier to T cell infiltration and function. These data suggest that we could improve PaC patient outcomes, if we could identify therapeutics that reprogram the protective TME to facilitate immunotherapy. One such approach is to target the oncogenic pathways that induce the fibrotic and suppressive PDAC TME. Recently, we have identified focal adhesion kinase (FAK)-1, which is hyper-activated as a major driver of the fibrotic and inflammatory (fibro-inflammatory) TME of PDAC tumors. We have discovered that in human PDAC, elevated FAK activity correlates with higher fibrosis levels, excessive myeloid cell infiltration, and poor T cell responses. These data suggest that FAK is a key mediator of the fibro-inflammatory microenvironment that blocks immunotherapeutic efficacy. FAK inhibition dramatically reduced fibrosis and inflammatory myeloid cell infiltration, and improved T cell function in PaC mouse models. 2) Understanding the differential effects of Macrophage origin on tumor fibrosis, immunity and progression. Example Project: Tumor-associated macrophages (TAMs) are essential components of the cancer microenvironment and play critical roles in the regulation of tumor progression. Optimal therapeutic intervention requires in-depth understanding of the sources that sustain macrophages in malignant tissues. In this study, we systemically investigated the ontogeny of TAMs in murine pancreatic ductal adenocarcinoma (PDAC) models. We identified both inflammatory monocytes and tissue-resident macrophages as sources of TAMs. Unexpectedly, significant portions of pancreas resident macrophages originate during embryonic development and expand through in situ proliferation during tumor progression. 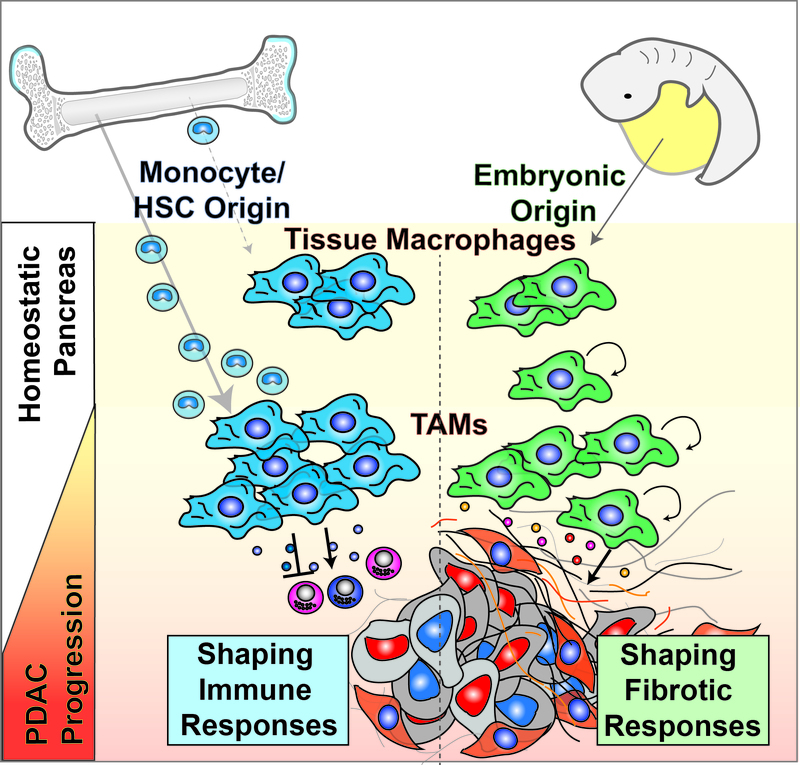 While monocyte-derived TAMs play more potent roles in antigen presentation, embryonically derived TAMs exhibit a pro-fibrotic transcriptional profile suggesting their role in producing and remodeling extracellular matrix molecules. Collectively, these findings uncovered the heterogeneity of TAM origin and functions, and could provide therapeutic insight for PDAC treatment. 3) Understanding the defects in Dendritic cell development and trafficking in cancer patients. Example Project: Tumors must evade immune-surveillance in order to progress. 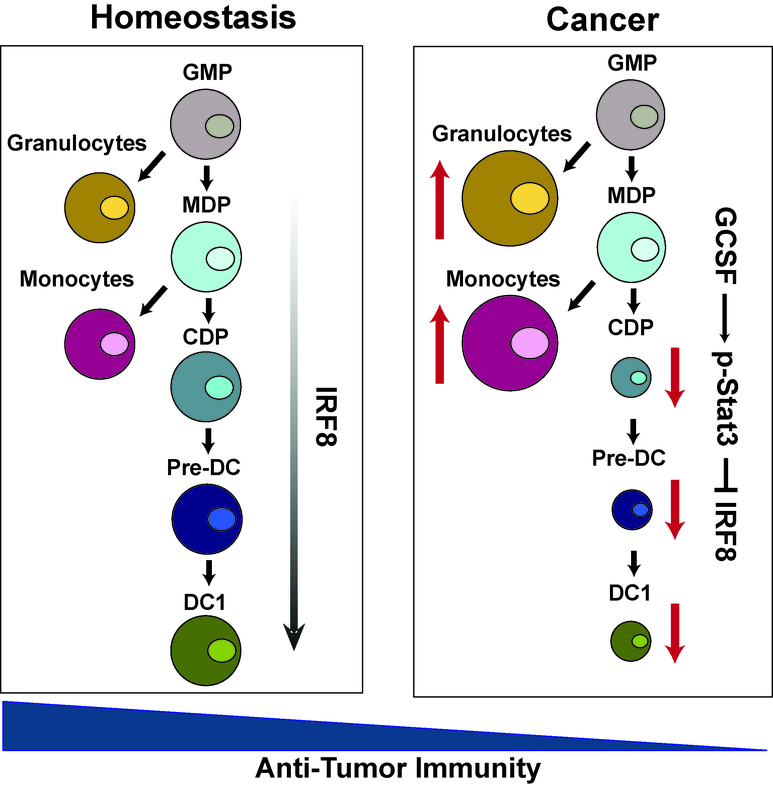 To this end, tumor-induced inflammation expands immune-suppressive immature granulocytes and monocytes, while limiting the functions of immune-stimulatory conventional dendritic cells (cDCs). cDC1s, a cDC subset, activate CD8+ T cells through antigen cross presentation and are marked by CD141 in humans and CD103 or CD8α in mice. cDC1s support anti-tumor CD8+ T cell responses, but cDC1 numbers are limited within the tumor environment. To understand how cDC1s are restricted in the tumor, we interrogated their development in the bone marrow (BM). We found the program responsible for the expansion of immature granulocytes and monocytes from progenitors in the BM is simultaneously suppressing the generation of cDC1s, decreasing the systemic numbers of cDC1s in breast and pancreatic cancer patients. We found that tumor-induced granulocyte-stimulating factor (GCSF) mediates the down-regulation of the transcription factor IFN regulatory factor 8 (IRF8) in BM progenitors. IRF8 loss reprograms the BM progenitors, reducing their potential to develop into cDC1s. We demonstration, independent of monocyte and granulocyte expansion, that tumor-induced loss of cDC1s reduces the systemic ability to mount anti-tumor CD8+ T cell responses. Further, systemic decreases in cDC1s in breast cancer patients correlate with reduced response to chemotherapy. These data suggest a new mechanism of immune-escape whereby tumors down-regulate cDC1 differentiation from BM progenitors to impair anti-tumor CD8+ T cell immunity. 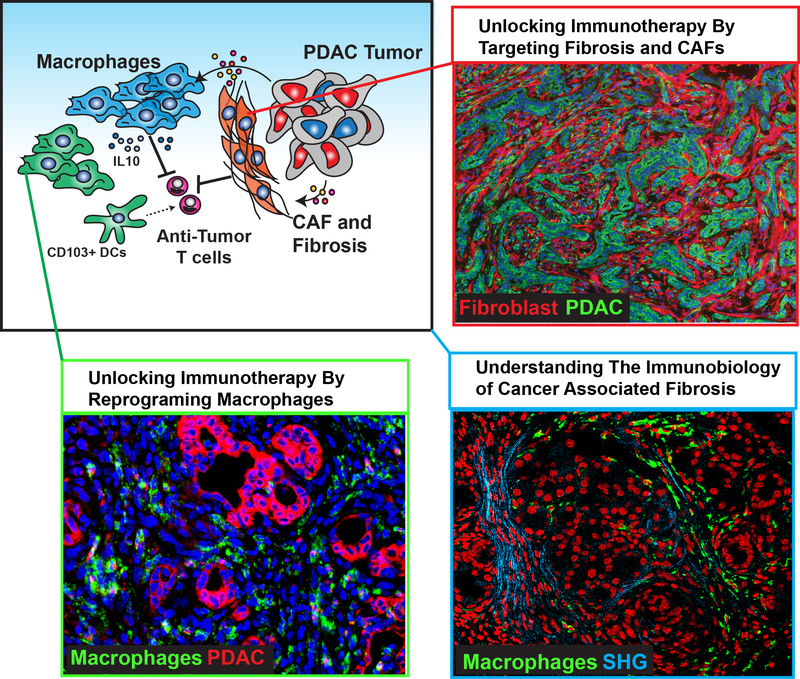 4) Targeting Macrophages in human PDAC to unlock responsiveness to immunotherapy. Immunotherapy against PDAC has struggled to achieve significant clinical benefit as single agents in PDAC. This is likely due to the presence of an immunosuppressive tumor microenvironment. Critical drivers of this immunosuppressive microenvironment are tumor-infiltrating inflammatory monocytes (IMs) and macrophages (TAMs). Thus, high numbers of these cells correlate with early metastatic relapse and poor survival in pancreatic cancer. Therefore, approaches that reprogram myeloid responses to potentiate protective antitumor immunity hold significant therapeutic potential. We and other groups have demonstrated that mobilization and tumor infiltration of IMs and TAMs can promote local immunosuppression, and resistance to cytotoxic therapy. Signaling through C-C chemokine receptor type 2 (CCR2) is critical for the mobilization of IMs and their recruitment to inflamed tissues. Our recently published reports clearly illustrate that blockade of IM recruitment using a novel CCR2 inhibitor, PF-04136309 (CCR2i), slows tumor progression, improves responses to chemotherapy and prevents metastasis in mouse models of PDAC. Based on these exciting and provocative data, we initiated a Phase Ib/II clinical trial targeting the CCR2 signaling pathway in patients with locally advanced PDAC. In this trial, we have observed a remarkable 48.5% response rate in the 33 patients treated with CCR2i + FOLFIRINOX. Additionally, this regimen was well tolerated (safe). These responses appear to be correlated with a marked reduction in circulating CCR2+ IMs as well as decreased immune suppressive gene expression profiles in the primary tumor microenvironment. Paralleling these clinical data, our published pre-clinical studies found that CCR2 blockade overcomes immune suppression to reinitiate anti-tumor responses via CD8+ CTLs. Intriguingly, we’ve discovered that CCR2 blockade in both human patients and mouse models leads to the up-regulation of T cell checkpoint pathways, including programmed cell death-1 (PD1) and its ligands. These data suggest that we might find unique therapeutic synergy between CCR2 inhibition and PD1-based immunotherapies.